Proud leadership moment! Pictured with me and Anthony Culpepper, BC’s Vice President of Finance and Administrative Services (2nd from left) and Nan Gomez-Heitzeberg, BC’s Executive Vice President of Academic Affairs (far right) are the six Bakersfield College employees in the graduating class of the 2013-14 Kern Community College District Leadership Academy. The Academy is our district’s grow-your-own leadership development program for employees. The BC graduates of this year’s Academy are (l-r) Greg Cluff, Jason Mattheus, Craig Rouse, Lisa Kent, Richard Marquez and Laura Lorigo. Bakersfield College’s 2014 Leadership Academy participants! I received a letter commending our BC Leadership Academy graduates from Michele Bresso, KCCD Associate Vice Chancellor and former BC administrator and faculty member, who directs the leadership program. 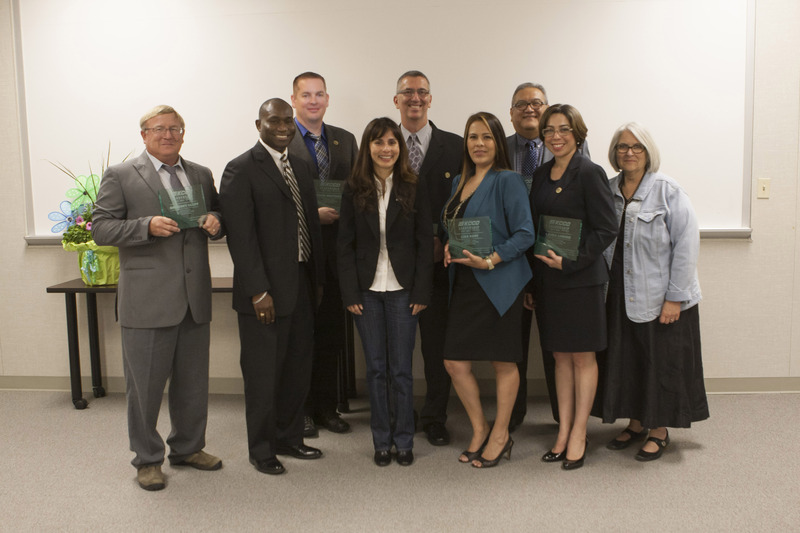 Six Bakersfield College employees are ready for the next step in their leadership journey after celebrating their completion of the annual Kern Community College District Leadership Academy last month. Richard, Lisa, Greg, Laura, Craig and Jason shined on behalf of BC with their commitment to learning about improved ways to serve our students. In the process, the BC team members grew their understanding of the California community college system and our district. The BC Six joined colleagues from our sister colleges, Porterville College and Cerro Coso Community College, to participate in team projects addressing KCCD’s strategic plan goals. Talk about stepping up to the leadership plate! We are very proud of the BC contingent that worked on three different projects to support meeting student needs. One team gathered best practices from faculty and staff so that they could share great ideas with colleagues district wide. Another team addressed student needs by collecting gently worn professional clothing and then giving away the clothes to students to help them look their best in job interviews. A third team organized campus beautification days at each of our three colleges and involved employees and students in the work crews. Strong leadership is essential to Kern Community College District. Bakersfield College can certainly be proud of the leaders in its faculty, classified and management ranks! Congratulations to these graduates of the Leadership Academy. Part of leadership is about being fully engaged, seeking new information and developing new solutions. These graduates proved they have the skills to be leaders on our campus and in our district.